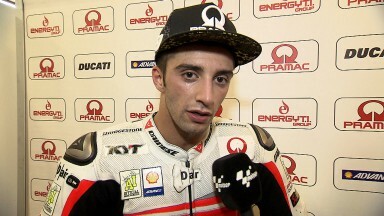 Andrea Iannone was able to bounce back from a disappointing Indianapolis race, finishing as the top Ducati rider in the bwin Grand Prix České republiky. 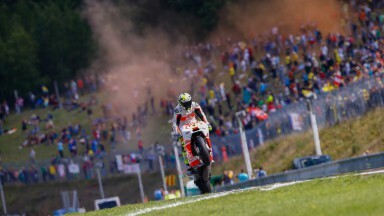 A front row start allowed Andrea Iannone (Pramac Racing) to take the lead on the opening lap of the Czech GP. Despite Spanish pair Jorge Lorenzo (Movistar Yamaha MotoGP) and Dani Pedrosa (Repsol Honda) getting past on the third lap, the Italian had ferocious battles throughout the race. Marc Marquez (Repsol Honda) and Iannone reignited their Moto2™ rivalry as the pair battled in the early stages of the race, coming together several times. After this Iannone became involved in a fight with future teammate Andrea Dovizioso (Ducati Team). Iannone was able to finish 0.2s ahead of his fellow Italian and secure top Ducati result in fifth. This equals his best result of the season from Germany. “In the second part Dovizioso and I passed each other several times, he was able to brake harder than me. I had fun and I'm happy for me, my team and Ducati. I am beginning to see a bit of light for the future!” he joked.